There has been a long-running scare campaign against the commonly-used herbicide 2,4-D, which has been conducted by a number of environmental groups, the Natural Resources Defense Council being at or near the front of the pack. NRDC uses the time-tested strategy of equating 2,4-D with Agent Orange — the notorious herbicide that was used to defoliate swaths of Vietnam during the war. The name Agent Orange itself sounds scary, and the concerns about the health effects of one of its components — 2,3,7,8-TCDD, aka "dioxin" — are legitimate. One of the components of Agent Orange was, in fact, 2,4-D. So was water. Neither had anything to do with dioxin. But, a second herbicide called 2,4,5-T certainly did. (During the production of Agent Orange, some dioxin was formed as an unwanted byproduct. This is what is responsible for the toxicity of the "brew.") Yet, NRDC tosses around the names 2,4-D, dioxin, 2,4,5-T, and Agent Orange interchangeably as if to imply that they are all the same dangerous chemical. They are not. Whether the group is doing this intentionally (lying) or unable to understand simple chemistry (incompetent) is anyone’s guess, but I’m going to give them a “break” and assume that they are competent liars. Whatever their reason, NRDC (and similar groups) have been exploiting this misconception for many years. Here is a sample of some of the many misleading statements that have appeared on the NRDC website over an eight-year period (emphasis mine): September 2008: "If you've used a pesticide on your lawn in the past 60 years, there's a good chance you've used 2,4-dichlorophenoxyacetic acid (aka 2,4-D) - a carcinogen that was also one-half of the recipe for the infamous Agent Orange." February 2012: "... NRDC senior scientist Dr. Gina Solomon [said] 'There’s no reason to continue allowing a toxic Agent Orange-ingredient in the places our children play..."' August 2013: "And the next generation of genetically-modified crops looks to be even more harmful, with the potential to unleash wide scale use of older and more toxic herbicides, such as 2,4-D (a component of Agent Orange)." September 2014: "2,4-D was also a component of the infamous herbicidal cocktail Agent Orange, which the United States used during the Vietnam War to destroy thick vegetation in the jungle." March 2016: "But both of these [two different cancers] can be caused by a number of chemicals, including dioxin, which was frequently mixed into formulations of 2,4-D until the mid-1990s." The sordid past of Agent Orange has been the subject of an ongoing, acrimonious controversy for decades. Anyone who remembers, or has studied the Vietnam War will remember the names Agent Orange, and dioxin (aka, 2,3,7,8-TCDD), as well as the myriad of health effects that were associated with the latter (will not be discussed here). But, since 2,4,5-T is no longer used, this discussion is now completely irrelevant — NRDC's wordsmanship notwithstanding. In each of the statements above, the group has crafted its words in a way that strongly suggest that 2,4-D is highly toxic and carcinogenic, simply because it happened to part of the mixture that also contained 2,4,5-T and its impurity dioxin. It is not much of a stretch for the reader to also conclude that 2,4-D itself also contains dioxin. But it does not, and cannot. It is chemically impossible: The above figure shows that 2,4,5-trichlorophenol — the raw material used to make 2,4,5-T — contains one more chlorine atom (red circle) than 2,4-dichlorophenol, the raw material for 2,4-D. This single chlorine atom makes all the difference in the world. 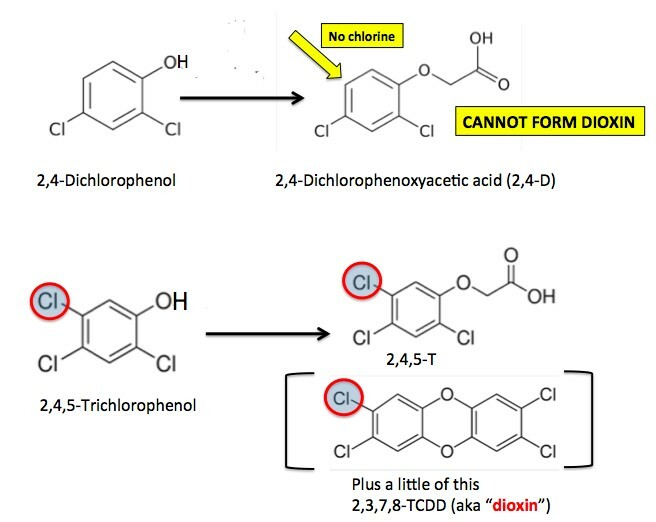 Since it is not present (yellow arrow) in 2,4-D, it is not possible to form dioxin during the manufacture of 2,4-D. This is the big lie, equating 2,4-D with Agent Orange, and dioxin. 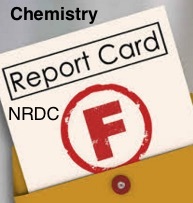 Here is how the statements should read if NRDC was even remotely interested in telling the truth: "The herbicide Agent Orange was a mixture of 2,4-D, 2,4,5-T, and dioxin — a toxic impurity that was formed during the manufacture of 2,4,5-T. Since 2,4,5-T is no longer used, dioxin cannot be formed. Neither Agent Orange, nor dioxin are in any way relevant to 2,4-D." Don't hold your breath. Disclosure: I own one spray bottle of weed killer that contains 2,4-D. But it is only half full.